lined up and ready to go. This was actually after we'd inched forward quite a bit. 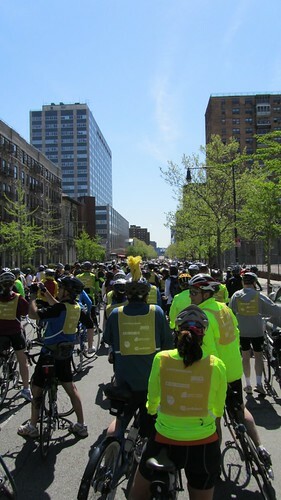 Imagine: 32,000 cyclists riding 42 miles of open road spanning all 5 boroughs – I braved this event and survived…barely. After waiting in line to get our bikes and riding a car-sized elevator several stories underground to claim them in the hotel parking garage (which by the way creepy & cool) we rode against the crowd toward what I thought was the start: Battery Park. Luckily, we wised up and turned around to follow the crowd. 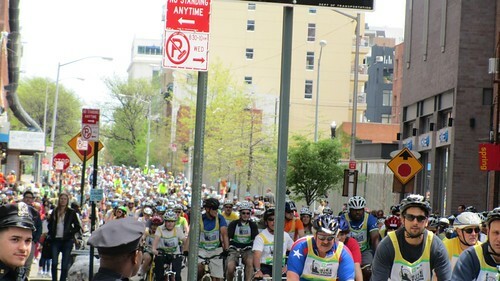 The 5 Boro Bike Tour, at times was an exercise in patience but it was also exhilarating and of course exhausting. After waiting in hotel garage line we waited in the start line crowd for about 30 minutes when 8:00 am came. My tension was starting to fade as my excitement and joy started to build and much to my chagrin a migraine started to make itself known. I was feeling more relaxed and happy and here came a migraine to ruin my day. After taking a pill for the headache we waited another 30-40 minutes, inching our way toward the start line and finally crossing it at about 8:40 am. A wave of relief poured over me as we were on the open road, I couldn’t help but smile and I made sure to slow down for the photographers along the route. The morning was chilly so I was sporting a thin long sleeve Longhorn jacket and some riding gloves for the first half of the ride. I even strapped a Bevo plush to my handle bars. We stuck to the far right lane or the slow lane as instructed in the pre-ride literature but very quickly realized that no one else read the rules and if they did they weren’t following them. faster riders kept breezing by nearly causing accidents so we merged to the center. There was a lot of that, faster riders wove in and out of traffic causing dangerous situations. Slower riders probably weren’t much better though, I’m sure they stopped without warning or veered into other lanes without notice. It would have been wonderful to have the marshals control these situations but they were often the ones speedy by. still lined up and ready to go - this time I can actually see the start line! Harlem. off the bikes again. they kept stopping us to let car traffic pass the cross street. Before I knew it we were passing the MOMA by and well on our way through Harlem and onto the Bronx. We encountered a pretty cool singing group cheering us on and a few people with their lawn chairs out. Overall though we got quizzical looks. I took a quick break after the Bronx to take off my jacket in anticipation of the Queensboro bridge which quite frankly scared me. The views on the west side were stunning and it was all new to me. There was some kind of impromptu cheer team cheering us on from the sidelines which was nice. I even saw a news reporter reaching over a guardrail to interview a cyclist. The Queensboro bridge felt like an old nemesis that had been haunting me when I finally arrived at it’s base I had already psyched myself out but insisted on defeating it. After some serious effort I swallowed my pride and pushed my bike up the steepest part of the bridge only re-mounting once we were nearly at the top. I wasn’t the only one doing it and I wasn’t the first one to do it but it still stung a little to give in. The sights on the bridge, however, were truly amazing. From there it seemed like the Queens/Brooklyn leg of the trip just would not end. Just constant teeny tiny inclines that only I was privy to. To be fair it was still fun but my legs were beginning to stage a revolt. My seat needed to be raised a smidge but without this handy dandy tool a friend gave me that wasn’t gonna happen and let’s be honest my conditioning wasn’t there. At this point though I really did anticipate finishing. I was looking forward to being done with the race and checking out Staten Island. I was confident that nothing was keeping me from the finish line. We gave my behind a short reprieve by getting off the bikes and stretching in Brooklyn. 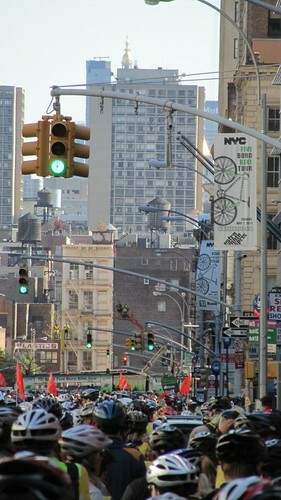 We pulled over near a cluster of restaurants and it seemed like every single one was draped in bicycles, helmets, & 5 boro bib wearing cyclists. They were having lunch – full meals and beer. They didn’t seem to mind the fact that they still had many, many miles before them. I on the other hand rationed my meals. I didn’t want to have any trouble on the road so I stuck to small snacks and Gatorade. Sport Beans are my friend. I learned that through running. Here is where the good part of the story comes in. The BQE. We took another quick breather near the top of this bridge. I felt like this would be my last stop before the finish or at least before having to push my bike up the Verrazano – whatever. I was sure I could handle that. We rode and enjoyed and suddenly we were at a complete standstill. The tour marshals and signage or lack thereof weren’t that helpful. There were some marshals that seemed like they took their jobs seriously, they rode around changing flats and circling back to check on stopped cyclists (but I only saw them near the start) and then there were marshals that were in it for the free ride. I don’t know what the qualifications were but I got stuck next to a group of 3 marshals and the main focus of their conversation was the free ride. None of the marshals appeared to have any way of communicating with each other or some “home base” which became extremely evident when thousands of us got stuck on the BQE and wanted answers. I had to get off my bike. We were sandwiched between people and their bikes. There was no stretching or sitting on the ground or letting go of your bike. There was no relaxing for precisely 2 1/2 hours. Every 10-20 minutes we got lucky and got to inch forward. There was no loudspeaker letting us know what the delay was, there was no signage. The “free ride marshals” to my left didn’t seem to have a clue. At some point I inched past them or they past me but eventually I was next to two more marshals – older and more experienced – who again had no clue. We were all trapped. If I was claustrophobic this would have been disastrous. There was a family on Paul’s right: mother, father, daughter (maybe 13), & son (maybe 10). The boy was getting so tired of standing with his bike he literally collapsed. He was leaning on his bike and lost control. 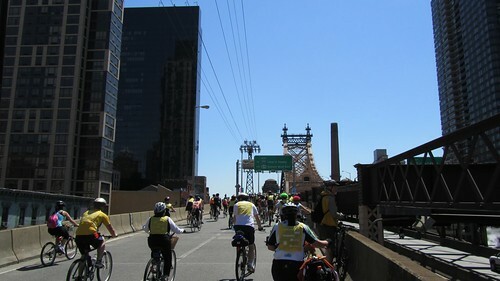 This is what the official 5 Boro website says to describe the BQE experience “you’ll enter the Brooklyn Queens Expressway, miraculously clear of its usual traffic jam just for Tour Day” – maybe next year. We were on the south bound side of the road and it was separated by a concrete guardrail. The northbound side was busy with car traffic, save for the lane closest to us which was blocked off by large orange jugs. Some very smart cyclists decided that riding south on that blocked off lane was a good idea. I think I saw the “free ride marshals” toss their bikes over to do the same, they weren’t alone. As we inched forward they breezed forward and then their lane ended and they were literally riding against car traffic & had to squeeze back into our lane which we eventually figured out was really just one lane now. A lone marshal standing on the concrete guardrail with a megaphone explained, we were being funneled into one single lane of traffic because the others were being reserved for construction. I saw no such construction. No hard hat. No workers in orange vests. nothing. Eventually a marshal came from behind yelling that we needed to make room for a golf card with medical personnel on it to get through and so we squeezed even closer to one another and low and behold there wasn’t an emergency in our bike traffic jam. Maybe there was one beyond us, I never saw it if it was there but I did see that the golf cart was being trailed by several marshals just wanting out of the jam then immediately followed by some quick thinking riders who managed to get through before the lane closed up again. At some point people were getting antsy and trying to squeeze into the tiniest of spaces between cyclists so Paul and I tried to stay extra close until we finally got through the jam. We passed some stunning sights along the south Brooklyn waterway. At this point I was both glad to be making forward progress again and in a full on battle with my knees to keep functioning. They were not interested in riding the bike anymore. Who could blame them. At some point I was riding along with what must have been a pained look on my face because an older man rode beside me and said “we’re all in pain too, it’s ok.” I smiled and kept pushing after he passed me. I knew that it was a losing battle though. We pulled into the last rest stop and actually took a rest. There were signs saying the stop was to close at about 3:00 pm, due to our 2.5 hour delay on the BQE we pulled in at 3:45 pm. It was overflowing with people and bikes. I sat on the grass near the info tent stretching as Paul went to get us some bananas and raisins. I overheard one of the officials on the phone with someone explaining that they couldn’t close their station yet because people kept pouring in and they couldn’t just turn them away. He couldn’t figure out why they were still coming in droves. 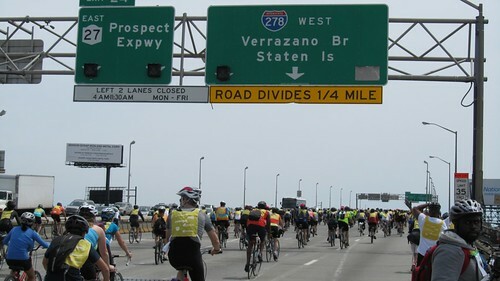 I went over to explain the BQE situation and ask about the Support and Gear (SAG) rides to the finish. They explained to me that they couldn’t start the SAG rides of cyclists and bikes until after the last rider passed them by and that at this point it looked like there might still be hours to go. The festival was scheduled to finish at 5. If this rest stop stayed open late then there was a chance the festival would too. There was also a chance I could make it over the bridge. I was totally fine walking but on the bike my knees didn’t want to cooperate. I could probably muscle through but then I had to consider the line for the ferry and the likely jammed trains in lower Manhattan as a result of the bikes. Paul could have finished easily. He wouldn’t leave me so we did the sensible thing and used our iphones to find the nearest train station and hopped a ride home. It was a humbling experience but the closer to the station we got the more people I saw pulling off the route to do the same. 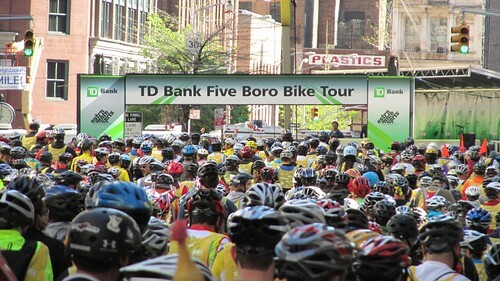 My 5 Boro Bike Tour ended a little past the 35 mile marker. I’ll round it up to 36 (after all the riding against the grain I did in the morning and then the inching forward just to get to the start – I deserve at least that). The next day I tried to go to work and realized I’d never make it up the stairs to get on the train so I called in. I slept and slept and slept. My very own Odinsleep, Paul watched out for me and brought me food. I really was rejuvenated afterward. Despite all the stops and starts and the very painful BQE experience I’m so glad we did it. What an awesome experience. Paul is already plotting for next year. IF we do this again I’ll train for it. I’ll ride closer to the front of the pack. I’ll finish. 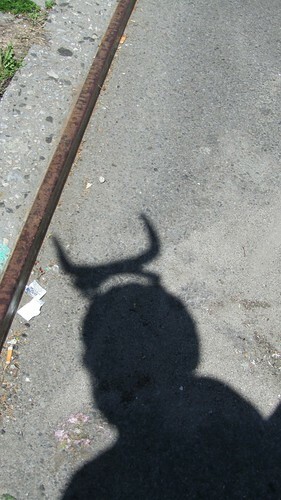 This entry was posted in events, everything i've blogged and tagged bicycle, bronx, Brooklyn, Central Park, cycling, harlem, manhattan, NYC, Queens, weekend adventure. Bookmark the permalink. 2 Responses to 5 Boro Bike Tour.